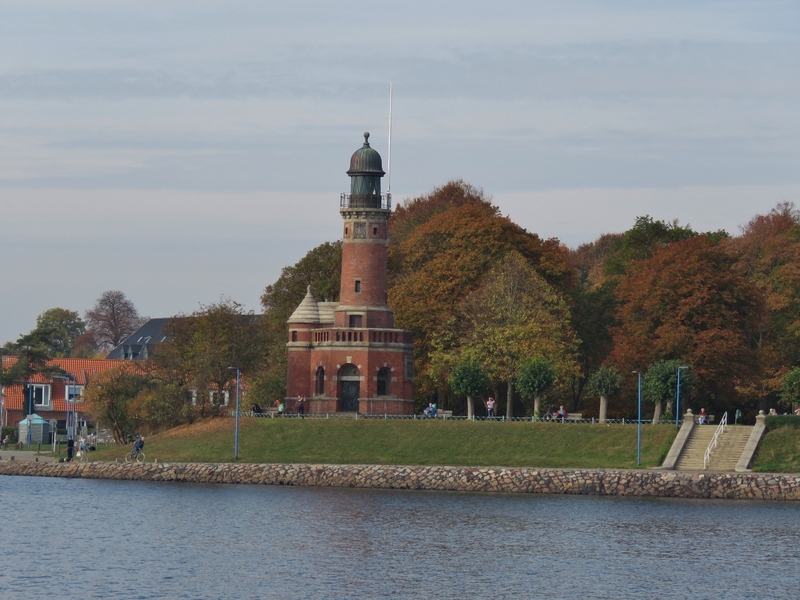 The Kiel Canal was completed in 1895, connecting the Baltic and North seas through northern Germany. 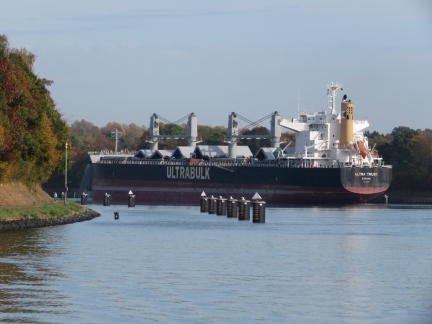 It is the busiest artifical waterway in the world and annually carries nearly as many ships as the Suez and the Panama canals combined. 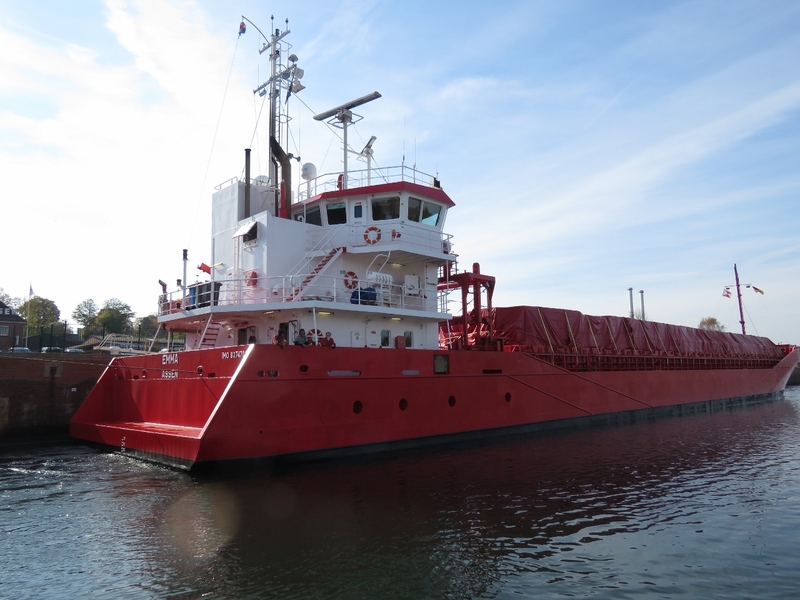 In contrast to Scotland’s Crinan Canal that we passed through last year, Dirona wasn’t even close the Kiel’s maximum dimensions of 772.6 ft (235.50 m) long, with a 106.6 ft (32.50m) beam and 22.97ft (7m) draft. 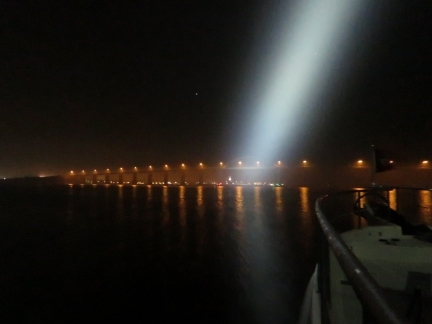 It was exciting to be operating in close quarters to such large vessels. We could have run the whole 51-mile distance in one day over about eight hours. 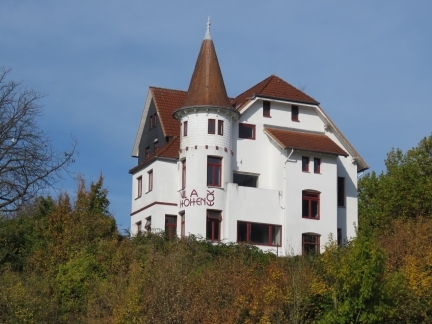 But we wanted to take our time to enjoy the experience, and spent three nights en route. 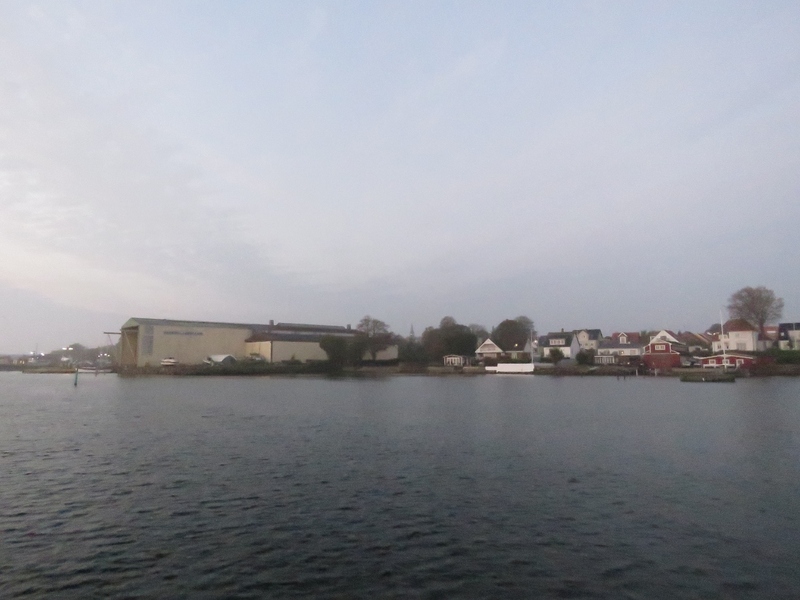 We arrived at the canal midday after a fifty-mile run from Thuro Bund in Denmark, paid our transit fee, locked through and soon were out in the water with the “big boys”. 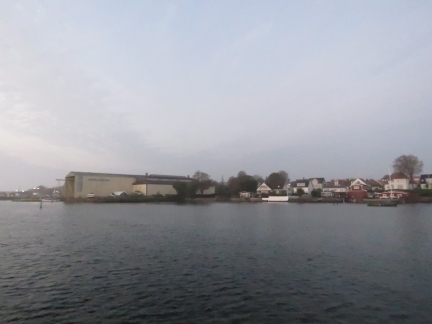 We stopped for the night eight miles along at Lake Flemhude, a moorage with a fabulous view to the passing traffic. 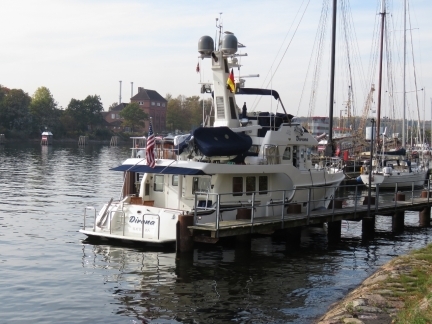 We departed the anchorage at Thuro Bund at 5am to reach the Kiel Canal by mid-day. 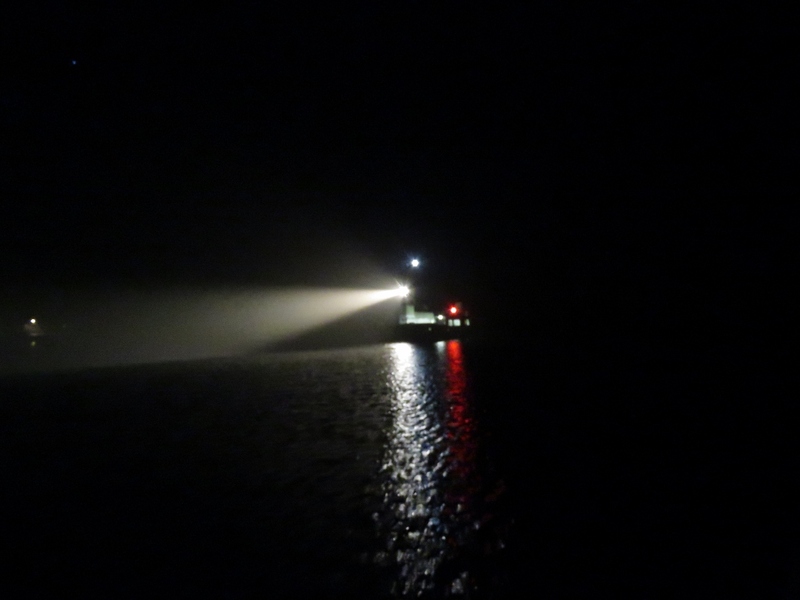 This meant we had to navigate the narrow channel through Middel Grund in the dark, and fog. 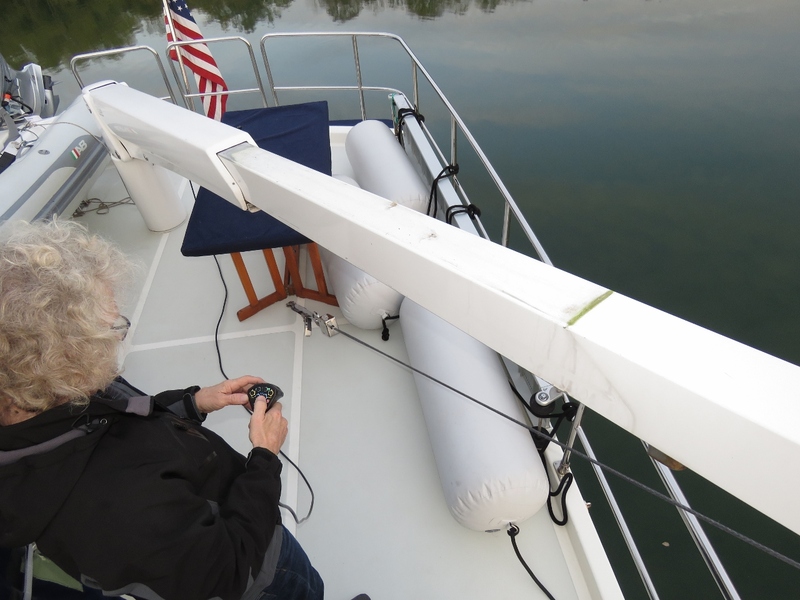 We were selecting the buoys as ARPA targets on the radar to ensure they matched up with our charts, but this was a little time-consuming. So we instead tried running in Dual Nav mode on the chartplotter, with a standard view on the left and radar overlay on the right. 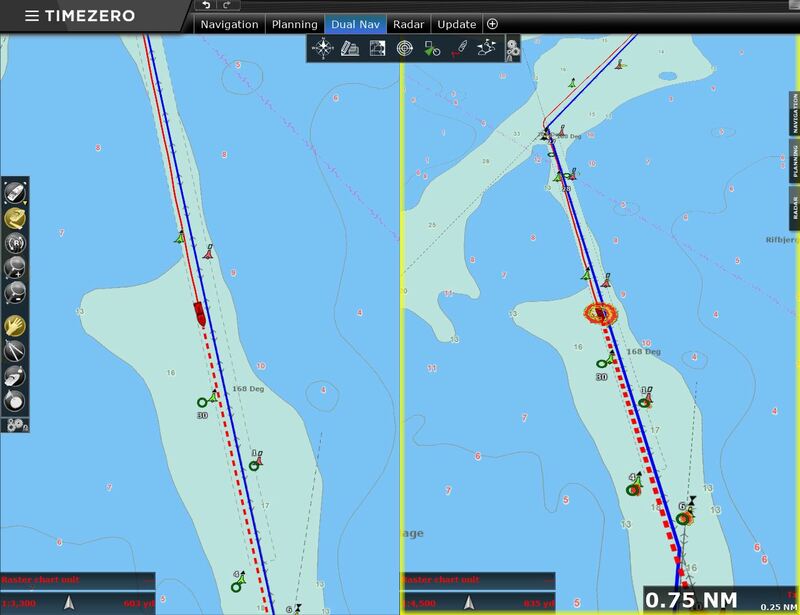 We generally don’t like to run with radar overlay on, as the it obscures chart information, but Dual Nav mode worked well for this purpose instead of selecting each buoy on radar. Approaching the bridge between the islands of Sio and Langeland at 6:15am. 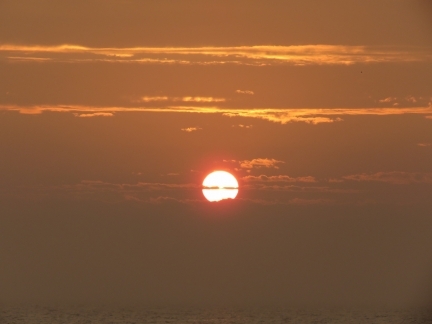 We’re not going to see light for at least another hour. The ferry from the island of Stryno approaching the dock at Rudkobing. 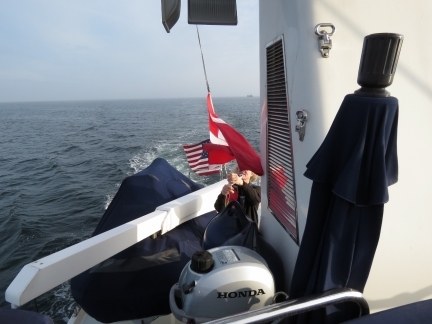 We were right up against the starboard channel marker to give it room to pass. 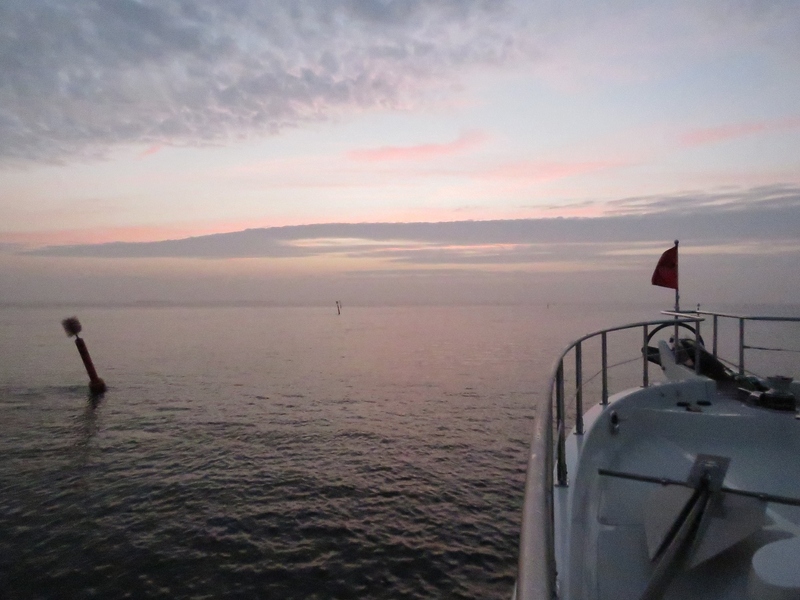 We’re finally getting some light around 7:30am off the town of Marstal. 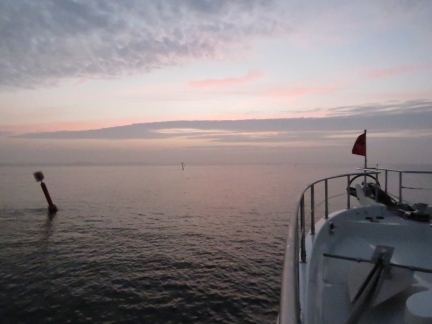 You can see how narrow the channel is—we’re running roughly central and the port-side buoy isn’t very far away. We’ve been getting some amazing sunrises the past few days. Lowering our Danish courtesy flag as we cross the border to Germany. 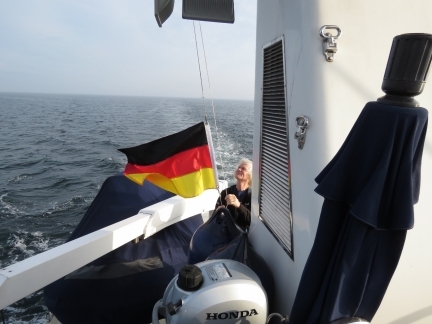 Raising our German courtesy flag as we enter Germany. 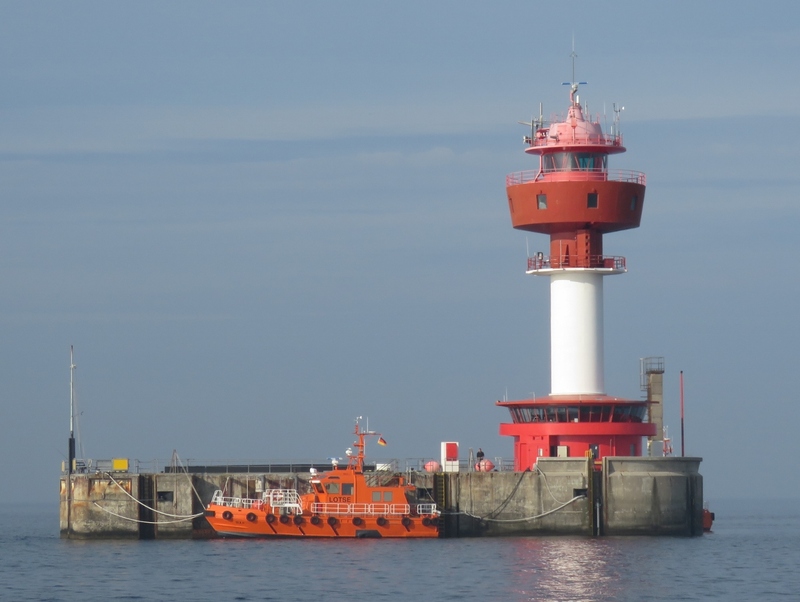 The Kiel Lighthouse and pilot station about 9 miles offshore from the Kiel Canal entrance. 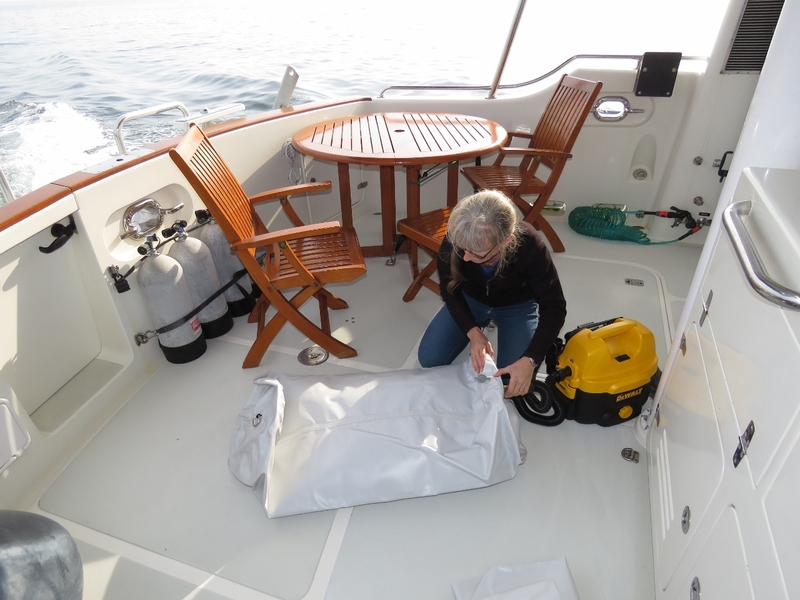 We inflated our extra fenders to deploy on the port side if necessary. 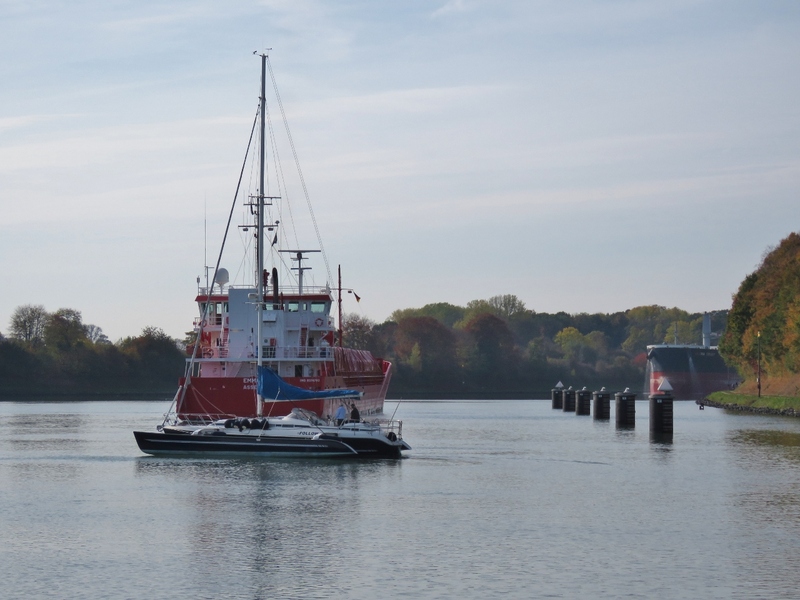 We expect to be docking on the starboard side without any other boats tied against us, but on the off-chance that we do need port-side fenders, we’d rather have them ready to deploy than be scrambling around at the last minute. 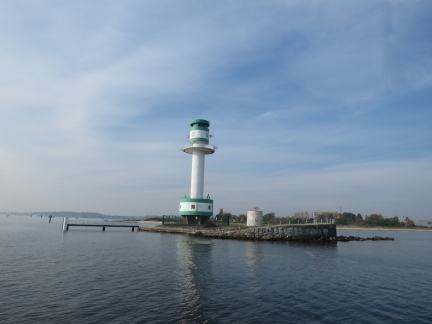 The Friedrichsort Lighthouse marks the entrance to Kiel Harbour and the approach to the Kiel-Holtenau locks. 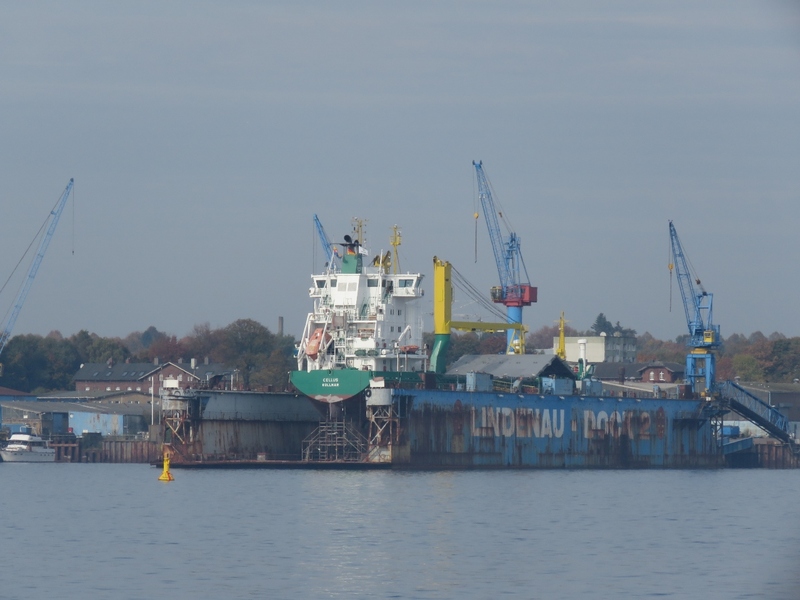 The cargo ship Cellus in drydock at Holtenau. 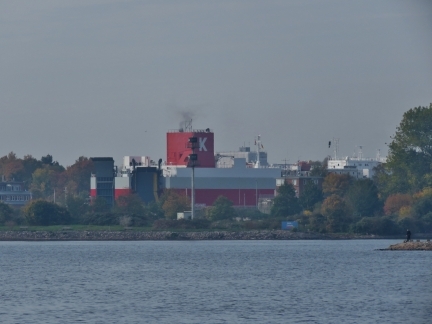 A “K” Line car carrier dominating the scene in the Kiel-Holtenau locks. It’s pretty exciting to think we’ll soon be in the Kiel Canal with ships of that size. The ornate Holtenau Lighthouse has marked the entrance to the Kiel Canal since 1895. 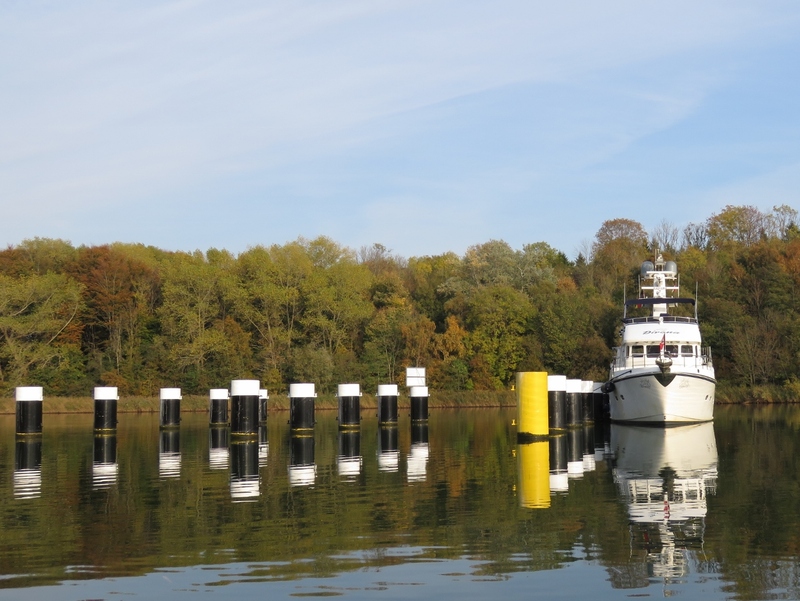 Moored in the recreational craft docks at Holtenau to wait for a lock opening. 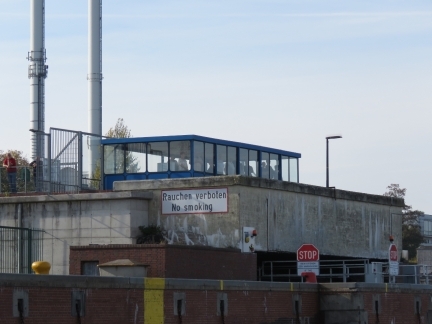 While there, we paid for our transit at a kiosk at the head of the dock. 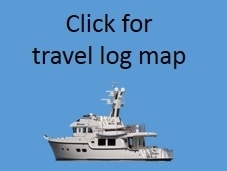 For our length boat, the transit cost €35 and is good for three days. When the light on the signal mast switches to only flashing white, that means we can approach and enter the lock. We got a white light about 40 minutes after arriving, so we’re good to go. 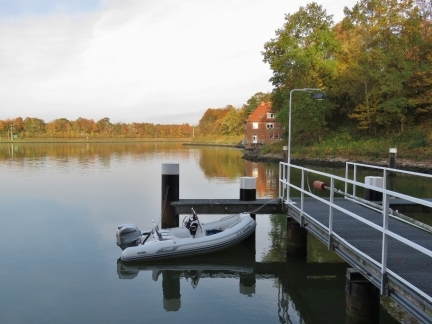 The Kiel Canal authority produces a for helpful booklet recreational craft operators that explains the procedures. Entering the lock with the cargo ship Emma, a tug, and two recreational boats ahead of us. 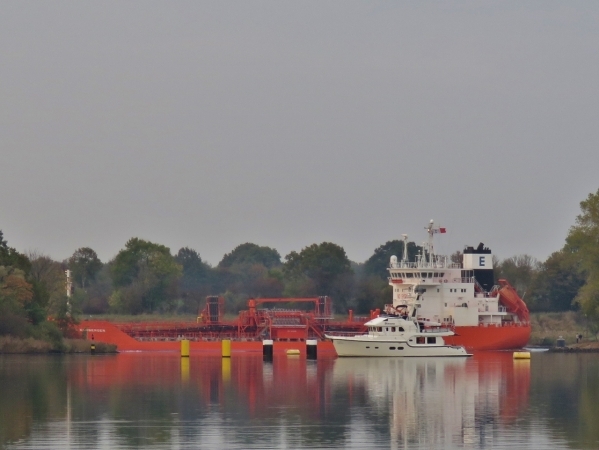 Recreational boats go in after the commercial traffic had loaded. The light on the signal mast at the our right just switched from a single flashing white, meaning recreational craft can approach and enter, to flashing red, meaning no boats can approach behind us. 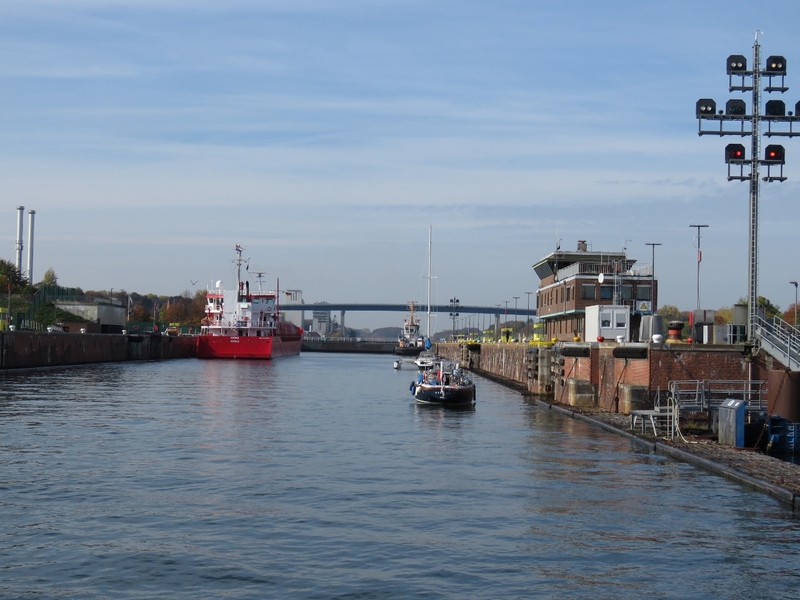 Tied off inside the Kiel-Holtenau Lock. The pontoon we tie to has little freeboard, so the fenders need to be floating to afford any protection. The nice part is that the platform rises and falls with the water level in the lock, so we don’t have to tend the lines. The gate closing behind us. 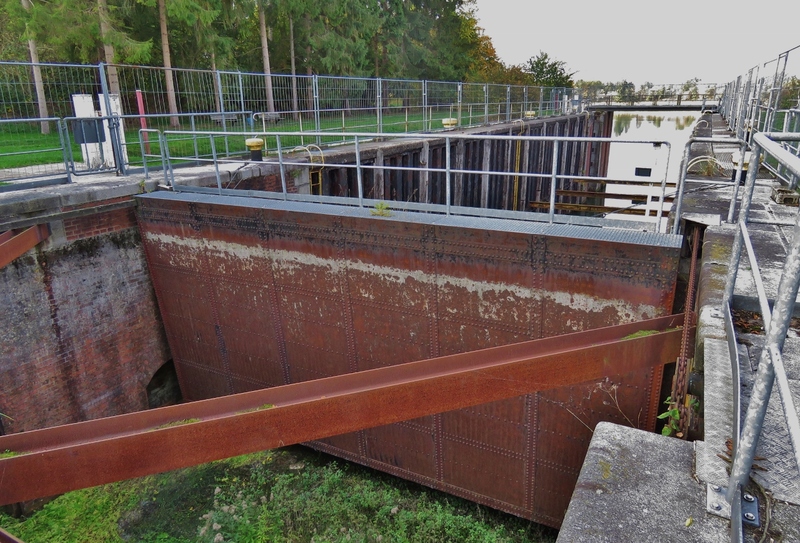 The water level inside and outside the lock differs by at most five feet. 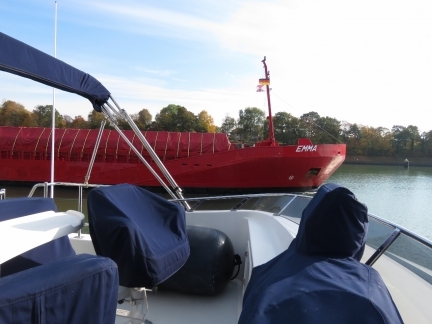 Passing alongside the cargo ship Emma as we exit the lock. Recreational craft enter after the commercial traffic, but generally exit first, likely to avoid problems with the wash from the larger vessels. 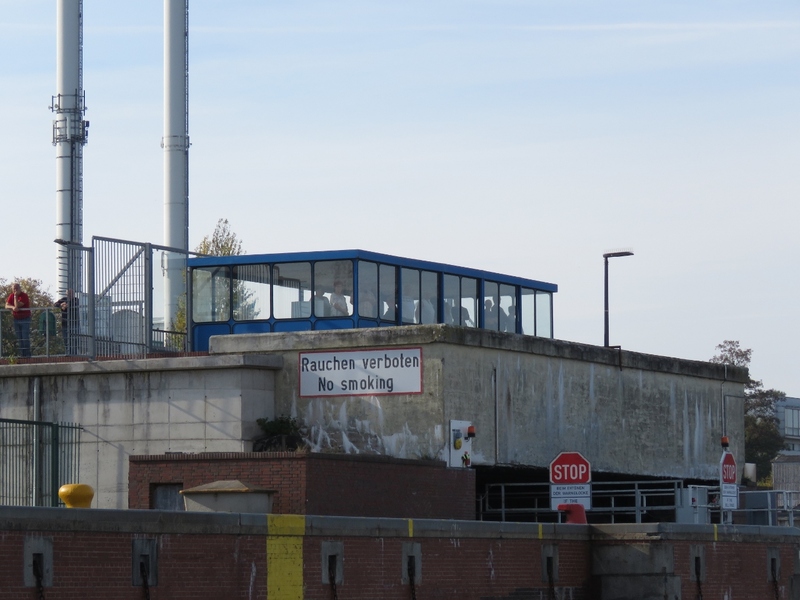 Onlookers in the lock observation area as we depart the lock 15 minutes after the gate closed behind us. Looking back to the cargo ship Emma as we exit the lock. 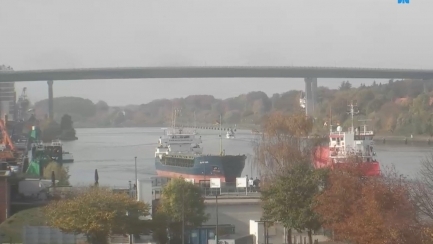 Blog reader Torbjorn Curtsson sent us this photo captured from the Kiel Canal web cam of Dirona passing under the Holtenau road bridges just inside the Kiel Canal. 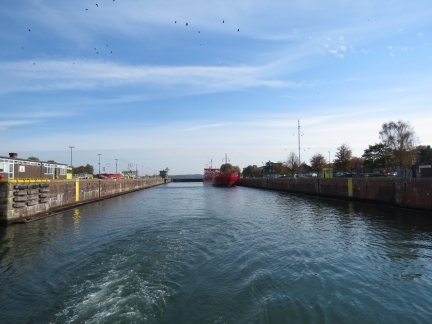 The cargo ship Emma on the right is exiting the lock behind us while another ship is about to enter the lock. 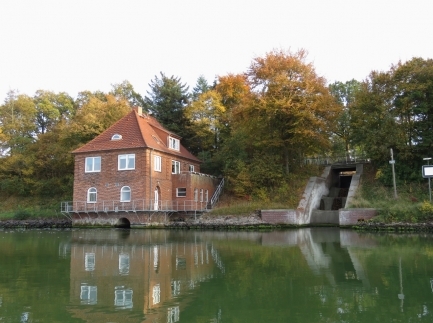 Villa Hoheneck has overlooked the Kiel Canal since its construction in 1903. 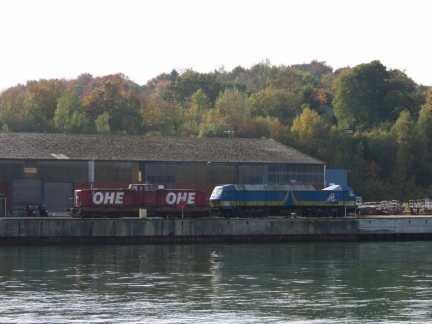 Two of several locomotives parked at a service depot along the south shore of the Kiel Canal. 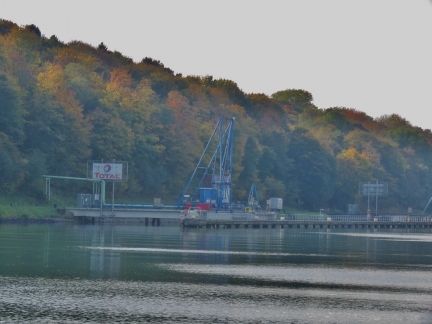 The Kiel Canal is used heavily for the distribution of oil products. 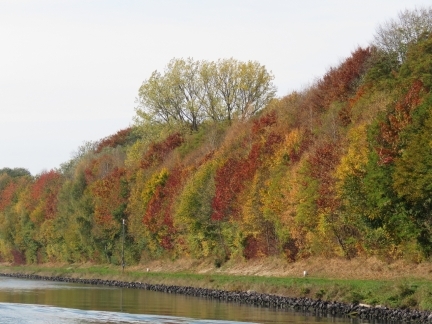 Beautiful fall colors along the canal. Exactly one year ago today we passed a similar scene along the much more intimate Caledonian Canal in Scotland. 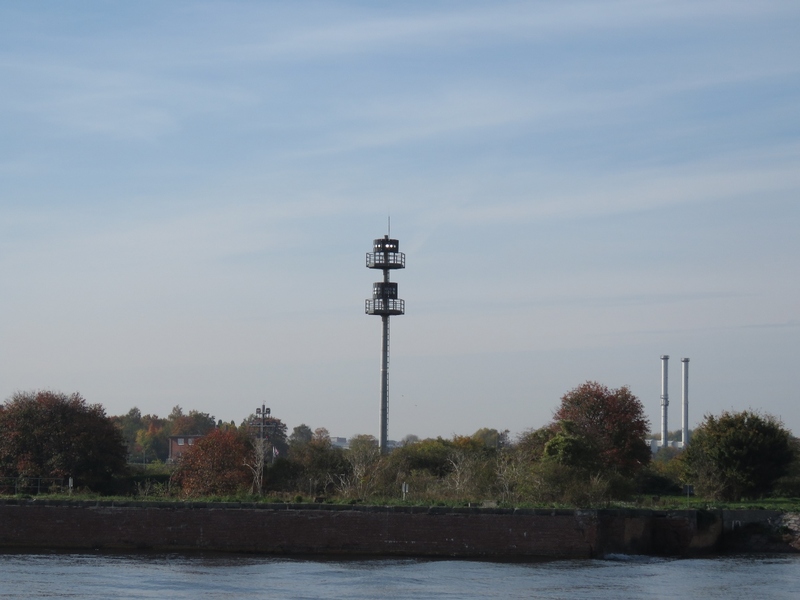 At various points along the canal are sidings, lined with dolphins, that are the only places that larger ships can pass. 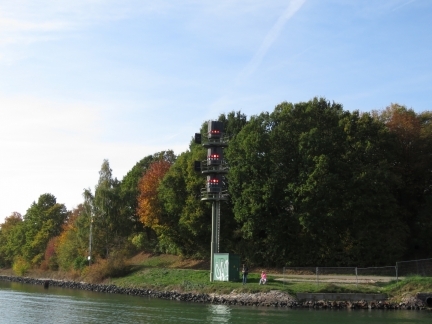 As with the locks, light signals control entry and exit from the sidings. 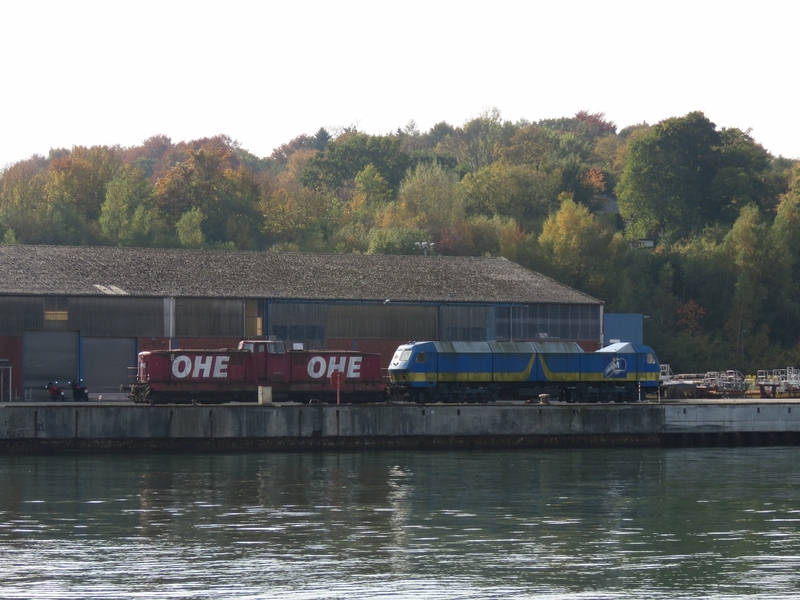 Here we have three red flashing lights in a vertical row, meaning no vessels (including us) can exit the siding. 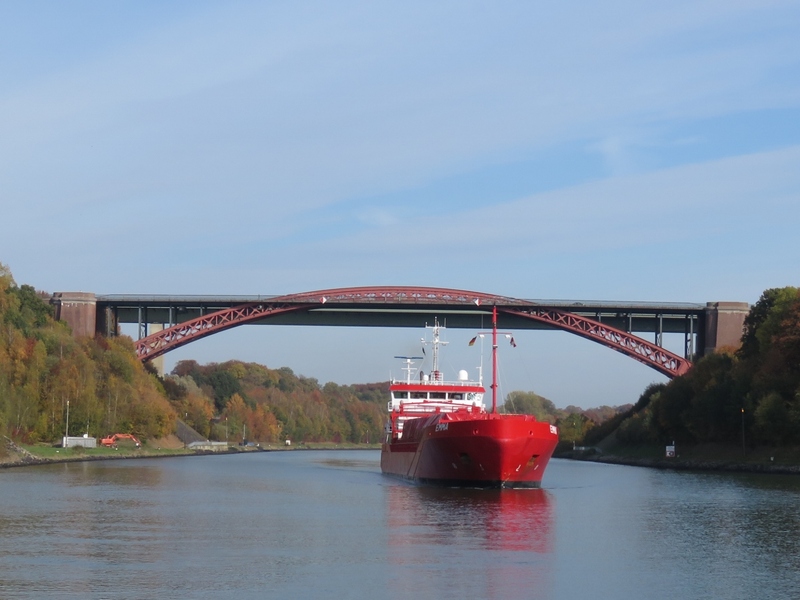 The cargo ship Emma passing under the historic Levensau High Bridge, constructed in 1894. 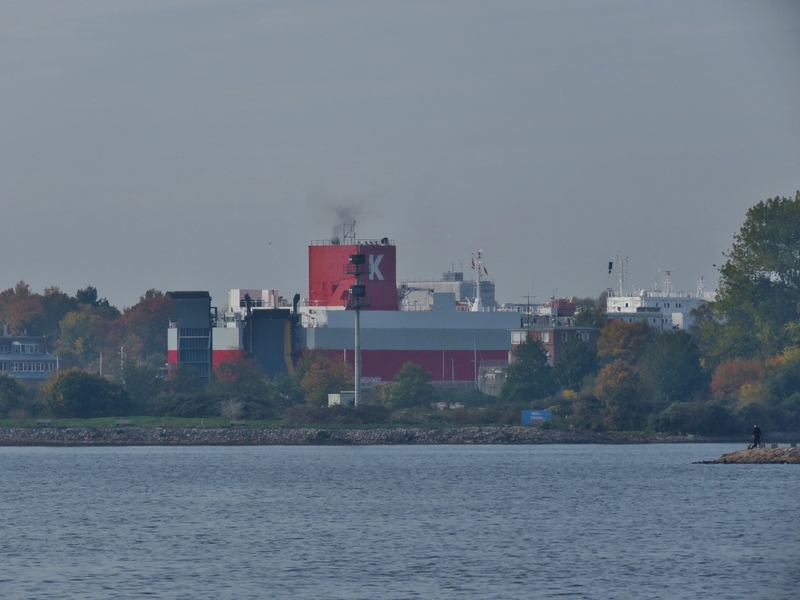 The cargo ship Emma passing us in the siding. 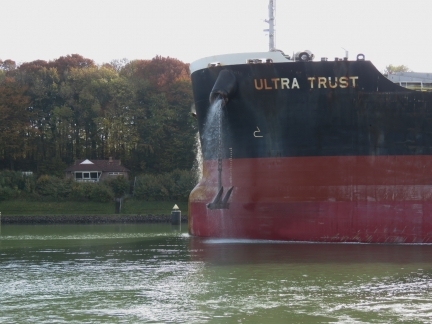 The sight of a massive bow of the bulker Ultra Trust approaching around the corner explained why no vessels could exit the siding. The cargo ship Emma, us, and a sailboat are waiting for the ship to reach the siding we are allowed to continue. 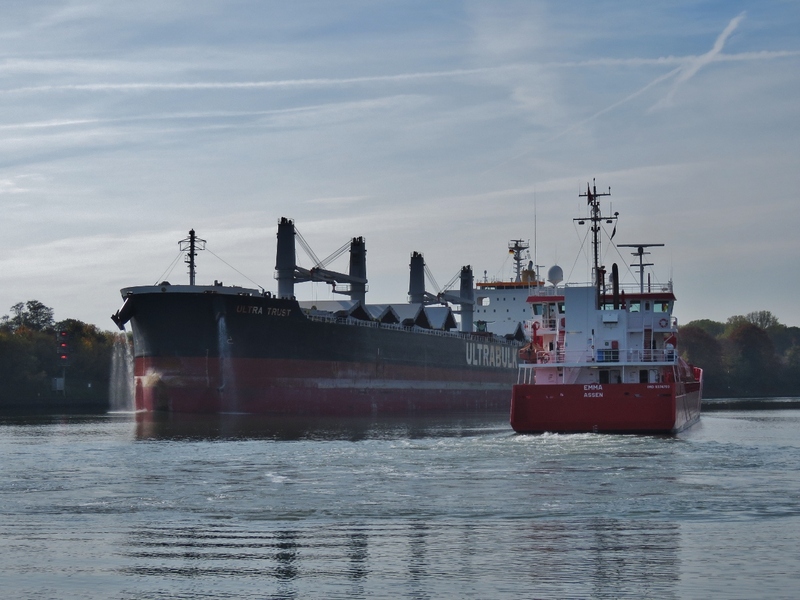 The 341ft (104m) cargo ship Emma looked large when passing us, but the next boat we’ll pass is the 656ft (200m) bulker Ultra Trust, which makes Emma look quite small. We noticed the anchor on the Ultra Trust was partially down in case it needed to be deployed in an emergency. 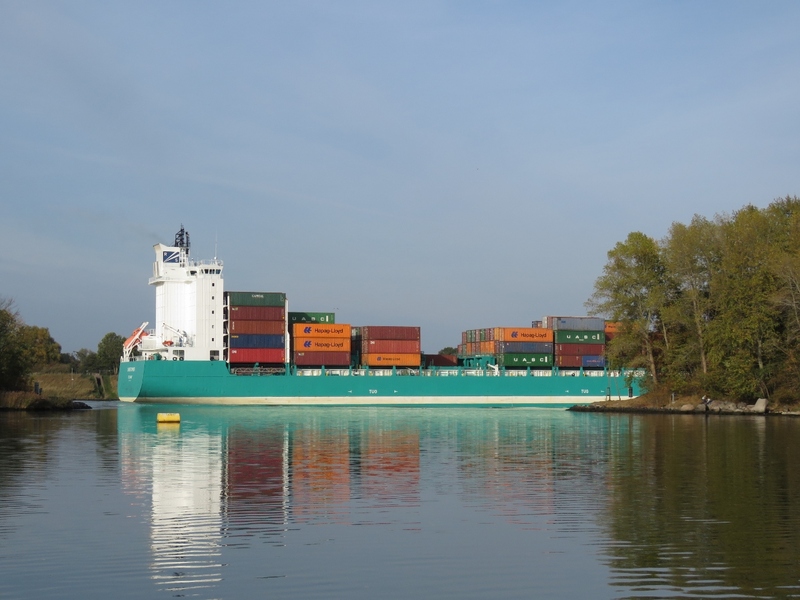 The 656ft (200m) ship is near the maximum dimensions for vessels in the Kiel Canal of 772.6 ft (235.50 m) long, with a 106.6 ft (32.50m) beam and 22.97ft (7m) draft. Ships less than 524ft (160m) long may draw up to 31.2ft (9.5m). 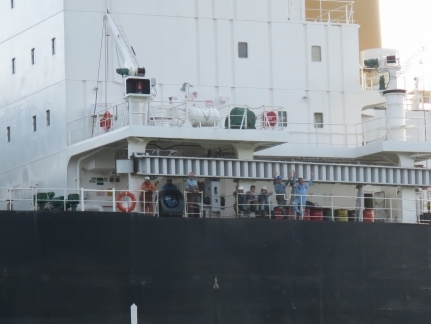 A wave from the crew of the Ultra Trust. That’s a load of ship. 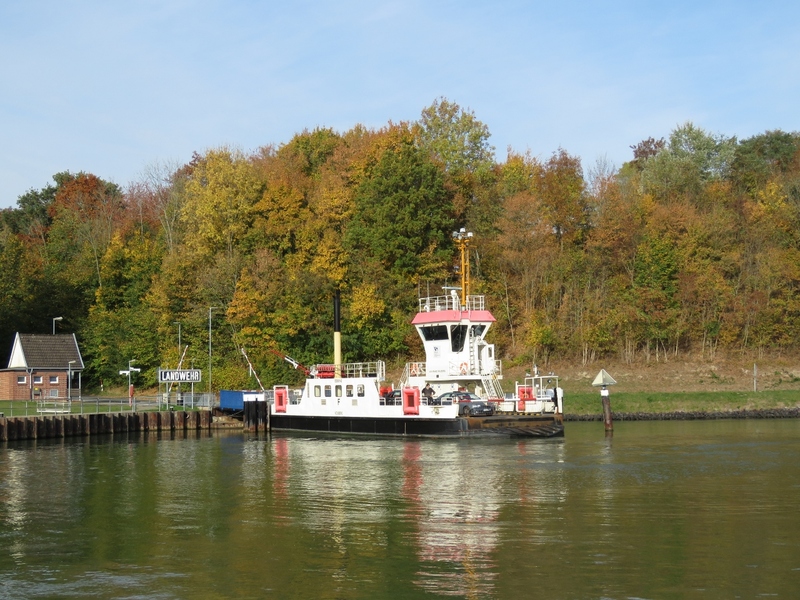 The Landwehr Ferry is the 2nd of 13 ferry crossings we’ll pass along the Kiel Canal. The Kiel Canal is 51 miles long and we could run the whole distance in one day over about 8 hours. But we instead wanted to take our time to enjoy the experience, and planned to spend 2-3 nights en route. 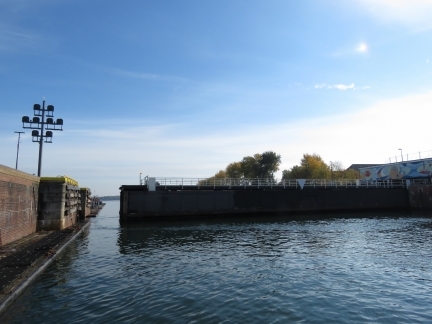 Recreational craft can only moor at one of six locations inside the locks—the first one heading head east is at Lake Flemhude, where moorings have been set out for recreational craft. These are odd moorings where small boats can tie bow-and-stern between pilings that are organized in a grid. This has the advantage of allowing a large number of boats in a small area, but has the disadvantage that Dirona wouldn’t fit if it was half the size. We found a novel solution of by tying off to the unused outside portions of the piling grid. One of the reasons we wanted to stop at Lake Flemhude was for the view of traffic passing through the canal. 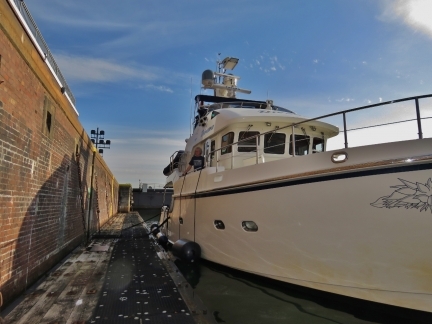 Fueling the tender before heading out. 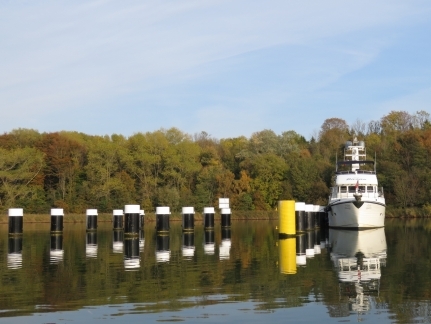 The pilings provide slots for ten smaller recreational craft to moor bow-to-bow in two rows of five, perpendicular to Dirona. Because we wouldn’t fit in that configuration, and none are in use, we tied across the entrance to three of them. 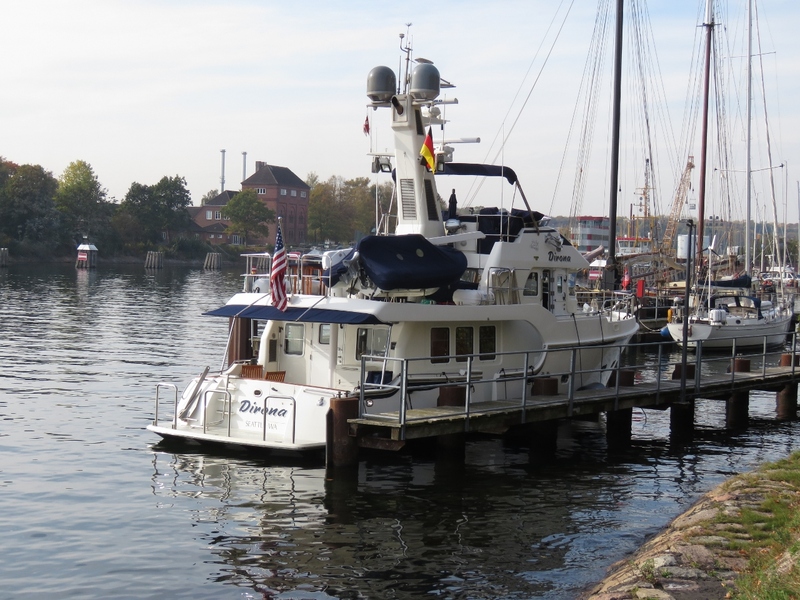 The tender tied off at the entrance to Achterwehr Canal, just east of Lake Flemhude, for a walk ashore. The Strohbruck Lock was built in 1913 to connect the Achterwehr and Kiel canals. It was decommissioned in 2001 due to the high cost of a pending renovation. Pumphouse near the Strohbruck Lock. 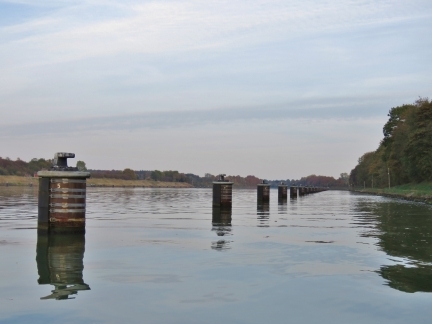 Looking down the outside of the series of dolphins that line the siding just west of Lake Flemhude. Larger vessels can tie against the left side of the dolphins to wait for another ship to pass. 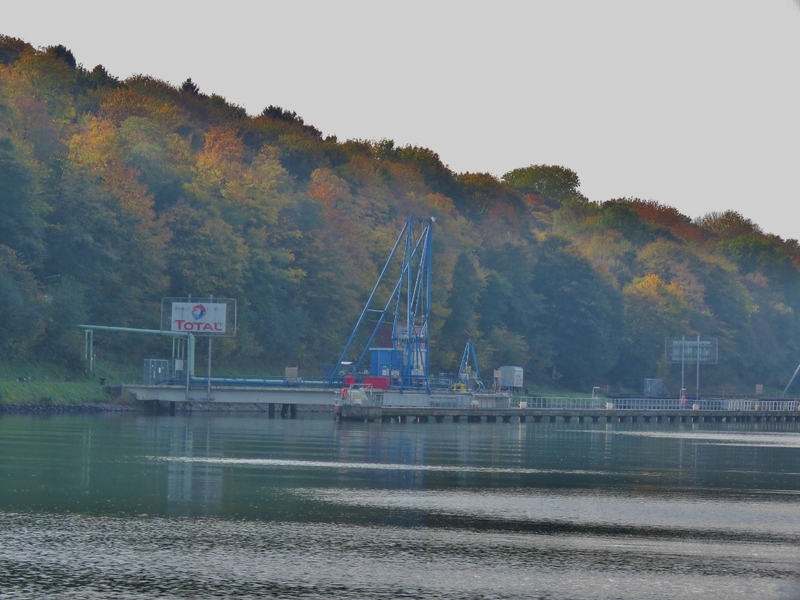 We loved the view from the mooring at Lake Flemhude to the ships passing in the Kiel Canal. Our davit extension/retraction mechanism failed while we were bringing the tender back on deck and here we are trying to retract the extension using the pulley. 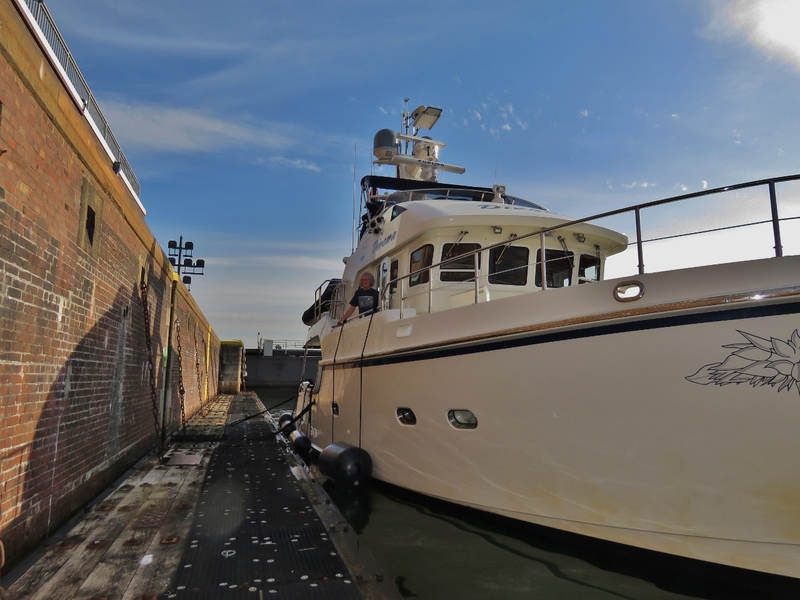 After the massive amount of work we did to rebuild it earlier this year, we were terrified the extension had jammed against the boom and we would have to open it up again. But “fortunately” the issue turned out to be intermittent and James was able to get the crane retracted.